Plone content management system provides an outstanding intranet/extranet solution. Being a well-proven CMS, Plone allows secure and easy access to the stored data. Having intuitive interface and powerful features, Plone can be customized and extended to meet various business needs. 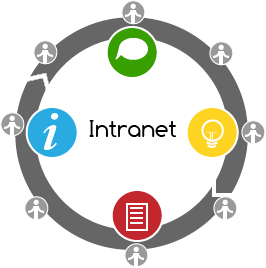 Intranet is one of the most widely used tools for modern companies. Many companies look for internal IT system to better manage their data, and at the same time reduce costs. Online place for storing important internal information can help company members do their daily tasks better and faster through effective communication and collaboration. But sharing knowledge within the organization or with customers can be a real challenge. Having no central place where employees and employers (and customers) could exchange information or collaborate can lead to the loss of valuable ideas and inefficient time use. Every company has different goals and needs, so it requires a different intranet or extranet solution to manage their business effectively. Need central corporate workspace to share files and manage projects within your company, with clients, customers, or partners? Looking for an effective way to organize information important to your company? Besides, Plone can also be integrated with a great variety of systems such as Active Directory, LDAP, Salesforce, SQL database, and many more. In case you are interested in Plone-based Intranet or Extranet solution, please contact us for more information.